← 1/23/14 POINT OF VIEW: WHO TELLS THE STORY? Stories about vampires and werewolves have been around for centuries but Michael Wallace manages to bring a fresh take to the old tale. 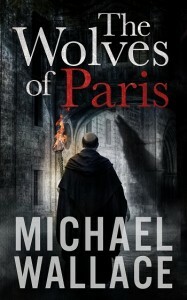 Far afield from his stories about Later Day Saints enclaves in scrubby patches of desert, in The Wolves of Paris, Wallace takes us back centuries to 1450 to weave a tale of sorcery and deceit. Two Italian brothers from a wealthy merchant family in Florence, travel to Paris to search for a man of their employ who has disappeared. They find a city terrorized, not only by supernatural creatures, but also by Dominican priests mired in the work of the Inquisition. One brother, Lorenzo, has already been “put to the question,” and resents his brother, Marco, for accusing him of heresy and turning him over to the priests who tortured him. The brothers also resent each other because they are both in love with the same woman; the beautiful and now widowed, Lady Lucrezia d’Lisle. Werewolves, or Loup-garou, terrorize the countryside. Where did they come from? Why do they seem to follow Lucrezia wherever she goes? And more importantly, how do the brothers protect the woman they love and get rid of the demonic creatures? Sure, it’s all a bit familiar, but the characters are brought vividly to life, the settings are dark and suspenseful and you care about these people, especially the brothers who struggle to come to terms with how they feel about each other and how to settle their rivalry over the woman who may not deserve either one of them. But what really sets this story apart is Wallace’s exploration of the post-traumatic affects of Lorenzo’s torture and how the young man struggles to come to terms with his own brother’s betrayal. It’s deeply moving and insightful stuff. The blood ties of family and the almost physical mandate to forgive family no matter what they may do is a familiar theme for Wallace. He most aptly explores those family themes in his previous Righteous series. Starting with The Righteous followed by Mighty and Strong, The Wicked, The Blessed and The Dammed, Destroying Angel and the most recent, The Gates of Babylon, the transgression of family and the need to forgive run throughout. It’s a series featuring the best of mystery, the kind that takes you to a new world—in this case, the world of Mormon fundamentalists, plural marriage, temple secrets and brutal murder. If you’ve not found these books, I encourage you to give them a look. Wallace is yet another example of how indie publishers are breaking the mold. Wallace demonstrates, over and over again, his mastery at taking us along on any path he chooses. M. L. Doyle has served in the U.S. Army at home and abroad for more than two decades as both a soldier and civilian. A Minneapolis native, Mary currently lives in Baltimore, Maryland. Mary is the author of The Peacekeeper’s Photograph, and The Sapper’s Plot, (July 2013) the first and second books in the Master Sergeant Harper Mystery series. The third book in the series, THE GENERAL’S AMBITION, is slated for release on Nov. 1, 2014. Mary is the co-author of the memoir, I’m Still Standing: From Captive U.S. Soldier to Free Citizen—My Journey Home (Touchstone, 2010) and co-author of, A Promise Fulfilled, The story of a wife and mother, Soldier and General Officer (Jan. 20140). She also released a series of adult romance novellas in the Limited Partnerships series (Sept. 2013) under the pen name Louise Kokesh. Mary has a bachelor of Arts in broadcast communications from Metropolitan State University and a Master of Arts from the University of Oklahoma in International Relations. Check out her website at www.mldoyleauthor.com.